I visited Matsuyama Castle in July, 2015. On top of Katsuyama Hill, overlooking the city of Matsuyama, stands Matsuyama Castle. It is easily spotted from almost anywhere in the city, and gives a good vantage point above Matsuyama. In feudal times it must have been easy to defend from such high ground. This entry was posted in Japan and tagged castle, history, matsuyama, museum on October 31, 2015 by Traveltorgeir. According to legend, the hot spring (onsen) at Dogo was discovered back in ancient times when an injured white heron healed itself in the hot spring. Suffering from an injured shin, the heron soaked its wing in the water every day until one day the bird was healed and flew away. Word quickly spread through Japan about the water’s ability to heal. This entry was posted in Japan and tagged Dogo Onsen, hot spring, matsuyama, onsen on October 27, 2015 by Traveltorgeir. I played a game of chess in Okayama in July 2015. Neither one of us gained much of an advantage in the opening, I was afraid he might be slightly ahead but it looked very equal. I wondered how good he was, if I would lose again. My confidence, after Osaka, wasn’t very high. I needed this win. I took one more look on the board and castled. My king was safe, I was ready. 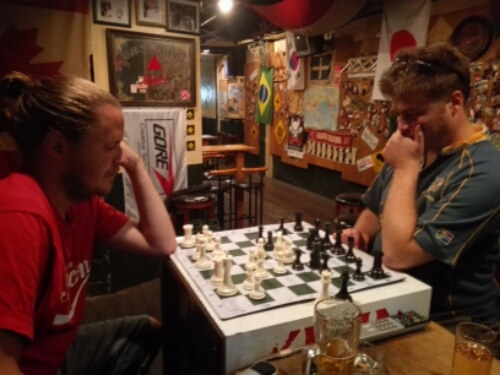 This entry was posted in Chess, Japan and tagged AFL, aussie bar, himeji, matsuyama, Okayama on September 12, 2015 by Traveltorgeir.